I’ve posted here on what you do with an idea to make money from it; and also here and here on how you can’t just sell it. Companies don’t buy ideas. Investors invest in ideas. Companies don’t buy ideas. You can’t just sell it. You say it’s great, but I say all ideas are brilliant before execution. Investors don’t invest in ideas. So don’t share it with investors at all when it’s just an idea. It has no value at that point, and you don’t even own it. Real investors don’t steal your idea but resent that you’ve wasted your time with just an idea. Investors never invest in ideas alone. 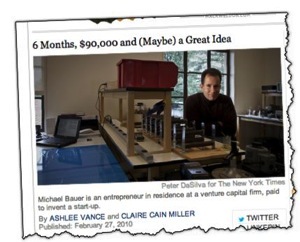 Rarely, they invest in a specific, known entrepreneur, as early as idea stage. But that’s a very special case. You know who you are. And if you aren’t sure, then you aren’t that person. By the way, later on, after you’ve done the work, recruited a team, met milestones, and gained traction, then you share it with investors because they don’t steal ideas. Real investors want the team in place so they can invest in execution, not execute themselves. Real investors don’t steal ideas and don’t sign non-disclosure documents. Make sure you do your homework, check backgrounds and history, for investors who are real and not conflicted with an existing investment. Second, share it carefully only with people you trust and want on your team. The next step after idea stage is recruiting a team. Trust is essential. Having skills and experience you need is also essential. Bring them into it so they become co-founders and help you develop from idea to business, motivated by sharing the upside. And real people will sign non-disclosure agreements because they don’t have the same reason that investors have not to. Use a non-disclosure agreement wisely. It’s not inappropriate with potential co-founders and team members, or friends and family investors. Don’t depend on it, don’t make it a huge issue, but use it in every case that isnt a big problem. Patents are for inventions and formulas, not ideas. You can’t patent an idea. If you have something patentable, by all means, apply for the patent. Don’t do a ton of work on it, or spend a lot of money, without first checking with patent experts. (but I’m not an attorney; check with an attorney of course). Copyright is for creative works. Copyright your code if you have code. Copyright is relatively cheap. It doesn’t protect you against copying because only the code is protected, the actual words; not the idea (but I’m not an attorney; check with an attorney of course). Trademarks are for commerce. Trademark your logo, your tag lines, your images, your main selling points as quotes. Trademark is relatively cheap too (but I’m not an attorney; check with an attorney of course). Register domain name and entity. Neither protects you a lot, but both are a good idea. Registering the entity protects your business name to some extent, as long as you were the first in the world. It can cost as little as $50. Registering the domain name, if you have a good one, protects you for that domain but not against copycats with similar names. Write your idea down and mail yourself 10 copies via registered mail. This can protect you later, with sloppy problems that come up, showing legal proof of what your idea was on what date. What is wrong, you ask, with thinking your business idea is worth a billion dollar idea? That you have the next unicorn? Nothing. That’s a dream. We all dream. We dream of writing a great novel, being a pro athlete, being a movie star, or being Steve Jobs, Bill Gates, Mark Zuckerberg. The younger we are, the grander the dreams. We’re built that way. It’s one of the joys of being human. And dreams inspire us. That’s why so many young entrepreneurs think their ideas are worth billions. And there’s nothing wrong with the dream as long as it doesn’t interfere with reality. However, the billion-dollar-idea (BDI) fallacy does interfere with reality, and way too often. That’s the dark side. Too many young people delude themselves into thinking that the BDI, alone, has value without work, execution, and getting things done. They think they can sell an idea. They waste their time and energy trying to sell that BDI without realizing that it’s not something they own, not something other people will buy, and not something that has value. And that’s a shame. <p”>In the real world, a good idea is like a beautiful day. Everybody owns it. Some people take more advantage of it than others. Look at the big wins in history. Jobs, Gates, Zuckerberg and other people who created billion dollar businesses didn’t waste even a second trying to trade on the idea. Instead, they got going with actual execution. They gathered teams together and got work done. The work turned their ideas into billion dollar businesses. The people they gathered turned the idea into a billion dollar business. As states move toward legalized marijuana, most of the fuss so far is about pot as recreational drug, all of which has to do with the THC ingredient, the key to the marijuana high. But marijuana also contains another ingredient, CBD, which doesn’t generate a high, but may offer interesting health benefits as a happy byproduct of marijuana becoming more readily available. Emerging research on CBD is quite promising. Evidence of varying quality supports the use of CBD for a wide range of serious medical conditions, including Alzheimer’s, anorexia, anxiety, atherosclerosis, arthritis cancer, colitis/Crohn’s, depression, diabetes, epilepsy/seizure, fibromyalgia, glaucoma, irritable bowel, multiplesclerosis, neurodegeneration, obesity, osteoporosis, Parkinson’s, PTSD, schizophrenia, substance dependence/addiction, and stroke/traumatic brain injury. We have been terribly and systematically misled for nearly 70 years in the United States, and I apologize for my own role in that. When marijuana became a schedule 1 substance, there was a request to fill a “void in our knowledge.” In the United States, that has been challenging because of the infrastructure surrounding the study of an illegal substance, with a drug abuse organization at the heart of the approval process. And yet, despite the hurdles, we have made considerable progress that continues today. Looking forward, I am especially intrigued by studies like those in Spain and Israel looking at the anti-cancer effects of marijuana and its components. I’m intrigued by the neuro-protective study by Raphael Meschoulam in Israel, and research in Israel and the United States on whether the drug might help alleviate symptoms of PTSD. I promise to do my part to help, genuinely and honestly, fill the remaining void in our knowledge. You can click on the image here for a three-minute video summary. There are still hurdles. Where I live, in Oregon, I can buy old-fashioned pot legally and with relative ease. And finally, as of just this month, I can also buy an ointment to treat joint pains, based on CBD oil primarily, which has no high or buzz whatsoever. Oregon legalized Marijuana last year, but regulations for oils, extracts, and edibles took a few months longer. I’m optimistic, and thinking this is a good opportunity waiting in the wings, with the final legal changes likely to come soon. I became interested because I know some people who are already gearing up for CBD businesses here in Oregon. Given the likelihood of verifiable health benefits, and the way things are changing, I think that’s a good bet. My Friday video for this week is on entrepreneurship and leadership from the Stanford Ecorner. If you haven’t been there for a while, check it out. There is a new interface, and it’s a great collection of speakers on entrepreneurship, startups, business, and investment. Silicon Valley veteran Mike Maples Jr. shares heartfelt advice urging aspiring entrepreneurs to “only do things that you think have a chance to be legendary.” By committing to always doing exceptional work and being around inspiring people, Maples says you will reap the cumulative benefits of a lifetime of excellence, and be able to enjoy it again whenever you look back. This is a two-minute excerpt from a longer talk. My answer to this question on Quora about ideas vs. execution “ideas don’t matter, only execution matters”? – has been getting a lot of views. So I decided to repost it here. The answer to this is that millions of people – and I mean that, literally, millions of people – right now, as I write this, as you read this, believe they have great business ideas. And hundreds have already taken this question to Quora, how do I get money for my idea? A good idea is like a beautiful day. Everybody owns it. You use it or you don’t. Other people may make better use of it than you do. Go ahead, quote me. Make my day. It’s not exactly that the idea doesn’t matter. It’s that you don’t own your ideas. You don’t know how many other people have the same idea at the same time. You don’t know how many fatal flaws there are in your ideas, fatal flaws that you wouldn’t know until you started executing. Until you do some work for the idea, you don’t own it, and you can’t sell it, so it doesn’t matter. Execution, on the other hand, is what gives an idea value. Businesses have value, and execution turns an idea into a business. The hard part is that execution also takes work, money, and doesn’t mean success. Quite often, after the work and the money are spent, execution has merely shown that the idea wasn’t really an opportunity. It was just an idea. “No battle plan ever survives first contact with the enemy.” – Helmuth von Moltke. Similarly, all business ideas are brilliant before they are executed. Ideas have to run through an obstacle course of hard realities before they are really opportunities. Few ideas make it. Everybody has ideas, Millions of business ideas are floating around everywhere. Every problem anybody encounters is a solution waiting to be unwrapped. Every time somebody follows the comment “there should be a better way” by suggesting a better way, that’s a business idea. An opportunity is way more important than an idea.The difference between idea and opportunity is huge. An opportunity is an idea somebody can execute, An opportunity is an idea you can execute on because the technology and product development will succeed, people want to pay for it, there is a team with the capability to execute, the needed resources are available, and the economics will work. Ideas have no value because nobody owns them and there are billions floating around every day. Opportunities are the beginning of something that can gain value. That idea you have, the one you think will make millions? If it’s any good at all, you’re not the only one to have it. You’re right now in a race with somebody else to execute on it. What’s more likely, however, is that it won’t make it through the gauntlet of execution. It’s really hard to get from idea to opportunity. Most ideas have huge fatal flaws that would be obvious to somebody with the right experience, but aren’t obvious to somebody who hasn’t tried to build on them. As you get into the reality of developing a prototype, fleshing it out, making a minimum viable product out of it, you’ll discover why it won’t work. Trying to design and code a software or web product quite often leads to the discovery of why it won’t work as conceived. As you get into the reality of user testing, initial marketing, you’ll discover that nobody wanted it. Or they wanted something different. Trying to get early users, customers, distributors, allies, or channels often leads to discovery of the hidden flaws. Why am I sharing this discouraging word? First, because I see so much noise and distraction related to ideas, sadly unrealistic suggestions, people asking experts how they can sell an idea.. People want to know where to sell their ideas. That’s all wasted effort. Second, because an idea somebody has about how to improve an existing product owned by somebody else (such as ideas to improve Facebook, or autos, etc.) is even more likely to have a fatal flaw in it. The companies who own that product probably know why your idea won’t work, even if you don’t. You gather a team, you develop early versions or minimum viable versions, prototypes, get on kickstarter, get traction, and so forth. You execute on the idea. And if you can’t find people who want to join you, get a clue. Irony: This post from about a year ago explains why you can’t sell an idea to a large company, and recommends not even trying. And dozens of reader comments ask how to do exactly what the post itself says they shouldn’t even try. And I get more comments all the time, plus emails on my ask me form, asking how to sell the idea to the big company. So I give up: Please promise me you’ve read this post before you go on. Know what you’re up against. Don’t be naive. Selling an idea to a big company is a one-in-a-million shot. You are probably wasting your time. But if you insist, here are my suggestions. Drill down on whether or not your idea is patentable. Patents are for inventions, not ideas. You either consult an attorney or do the research yourself. It’s a tough subject because it’s not what you think it should be, it’s what the real world and the beaurocrats do. And having a patent isn’t enough; it has to be a good patent, that protects against work-arounds, and will hold up in court. And a patent is something you can own. And sell or license. If you can phrase your idea as a creative work then you can protect it with copywrite. That’s for books, songs, recorded performances, software products, films, television shows, paintings, and so forth. That’s protection, and ownership, but it doesn’t mean you can prevent people from copying you. If it’s good, they will. The other way to own an idea is to build a company over it. We call this general are one of trade secrets. It’s like the classic secret sauce. You bottle it, sell it, and hope imitators can’t reproduce it. So you can approach that target big company as a business already selling something, instead of just an individual with an idea to sell. Yes, that takes work; but your odds of success are much better. It won’t hurt to periodically write your idea down on paper, describe it as best you can, and mail it to yourself by certified mail. Do that whenever the idea changes. If you do, then at some future date, if you’re in a dispute, you can open that registered and sealed mail in front of a judge to prove what your idea was when. But don’t trust this protection very much: having an idea first doesn’t mean you own it. You need an attorney. (Note: I’m not an attorney; I can’t give you legal advice; I’m sharing my non-attorney experience as a business owner). Although non-disclosure (NDA) and confidentiality agreements are slim protection against big companies, it’s still better to have them than not to have the protection they offer. And an attorney you trust. I have to admit, I can’t tell you how to do this; I’ve never heard of anybody doing it successfully. In theory, companies have some system for managing these contacts. Visit their website, call their main phone lines, investigate and explore. I do know that companies vary widely in how they deal with suggestions. Some have web forms. Some have employees. Some have a wall that’s hard to penetrate. And maybe there’s some that sift through ideas with interest and respect. Often, finding the right person to talk to within a big company is like a reverse telephone tree. You start calling phone numbers available. With each call you make, you ask who’s the right person to talk to. With each new person who puts you off, you ask for another suggestion. If you find yourself actually dealing with that big company, pitching your idea, wow, I’m impressed; and you’ve already done the impossible. I hope you have a good attorney. I hope you succeed. My advice is be extremely skeptical and extremely cautious. This is me giving back, making it up to all the spreadsheet haters. It’s a non spreadsheet: lists, tables, yes; but no formulas, functions, or programming. It just adds the rows and columns automatically. I call it Free the Numbers. I’ve been a spreadsheet guy since 1979. I wrote three books on how to use spreadsheets back in the 1980s. I published spreadsheet macros. But I always thought that bulk of spreadsheet use could be simpler, like this new non-spreadsheet. No formulas. Just add to rows and columns. Automatically. Project costs, estimates, worksheets, proposals, plans … the world is full of lists and tables. And, while I love spreadsheets, I get it: most people don’t. So that’s what this is about. It’s free. It’s easy. Please try it. And if you don’t see the video here, click here for the source on YouTube. Or just go to FreeTheNumbers.com. Actually I liked several of them. Sramana has 10 cartoons like this one available as a Youtube playlist. Nice work. And if you don’t see the video here, I apologize. You can use this link to go to the source in Youtube.